The rock climbing in Malta is some of the best in Europe, says Cat Mills. So she jumps at the opportunity to try it. This might be a misleading title – after all, I’m not a rock climber, but I do like to hang out with them. When I moved to Malta I was immediately struck by the beauty of the country; the surrounding royal blue Mediterranean, the cloudless skies and the beautiful limestone rocks. Winter rains welcome in bright green fields, but in the summer Malta is a country of blue and yellow. Throw in some tropical fish and traditional Maltese fishing boats and you have yourself an album of stunning photography and a collection of incredible memories. When I arrived it was early August and the heat was something I had never experienced. 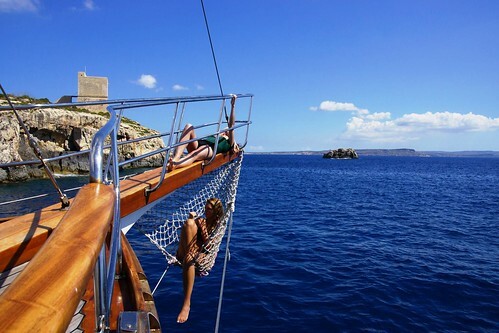 There are really only two ways to escape the heat in Malta; air conditioning and sailing through the crystal waters on a private boat. 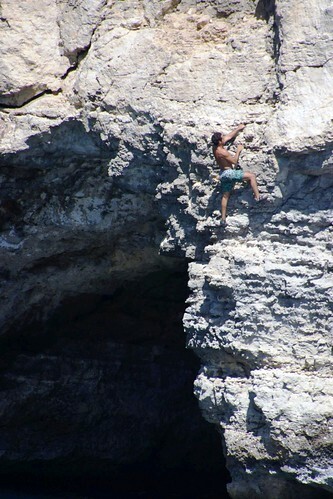 The rock climbing in Malta is some of the best in Europe, if not the world. Jagged cliffs perched over tranquil turquoise waters make the scene almost dream like. Needless to say, there is an active community of climbers in this tiny country. When I was invited to join them for a day of sun, snorkelling and climbing I jumped at the opportunity. While watching the sailboat pull in to the dock, ready to take us on our journey, I couldn’t help but feel that this was all a bit surreal; I felt like a woman in an advertisement, in a bathing suit lounging elegantly on her own private yacht. Even though there were around 50 of us, it never felt crowded. We sat on the cushioned seats as the boat peeled through the water, the wind whipping our hair around our faces and the morning sun warming our limbs. 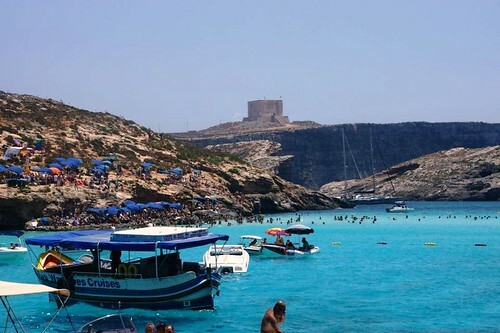 The boat pulled up to some jagged cliffs located around the corner from the famous Blue Lagoon on Comino Island. People pulled on their tight climbing shoes and either hopped on the dinghy to be brought out to the cliffs or else just dove right in the waters and swam to their destinations. A few friends and I donned our snorkelling gear and leapt in, marvelling at the light blue school of fish swimming at our feet and the way they demolished bits of bread floating nearby. Careful not to cut our bare feet on the sharp stone, we pulled ourselves out from the sea and climbed through a cave where several tidal pools waited. The extremely salty water had left a white ring around the edge of the pool as we looked in and saw some crabs scuttling about. Putting our feet and hands into the water we were thrilled to find that we were being investigated by tiny transparent shrimp, keenly fascinated by our red nail polish. Soon the boat was pulling out and making its way to Gozo, the second largest island in the Maltese archipelago. Several people had fallen asleep on the deck, taking in the sun, while others perched themselves on the mast of the ship. Once the boat threw down the anchor a group of climbers swam out together to reach a hidden cave. 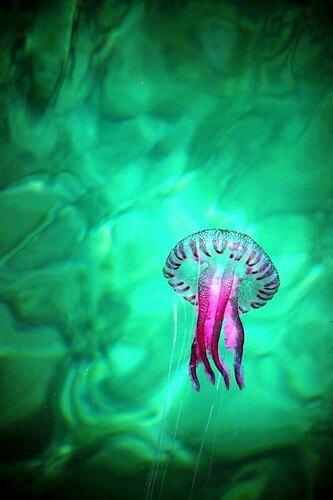 They returned 15 minutes later, retreating from their cause after unpleasantly discovering that the area was full of mauve stingers, the most common jellyfish in these waters. Bottles of white vinegar were passed around and splashed on the minor stings, relieving the pain and cooling the skin almost immediately. The day was drawing to an end, so we lounged on the decks, ate peanuts and drank warm beer from glass bottles. As the sun set I couldn’t help but wonder what this country had in store for me next. 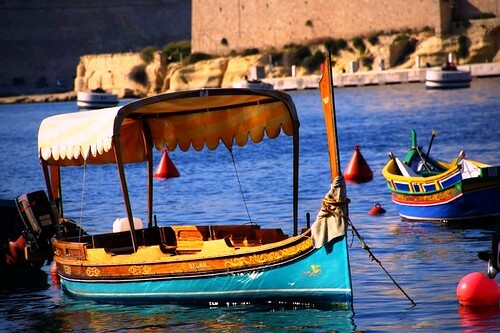 Private boat rentals are a popular option when visiting Malta and can be quite affordable if you have a large enough group. There are also countless boating tours you can hop on that range from one hour to the whole day and will take you around to the most popular destinations. Take a look at our flights and holidays to Malta from £139. Follow Cat’s journey around the world to experience the wildest, wickedest, and weirdest festivals known to man on her blog Wicked and Weird Around the World, Twitter and Facebook page.